Acknowledged author Robert L. McDonald wrote Derivatives Markets (3rd Edition) (Pearson Series in Finance) comprising 992 pages back in 2012. Textbook and etextbook are published under ISBN 0321543084 and 9780321543080. 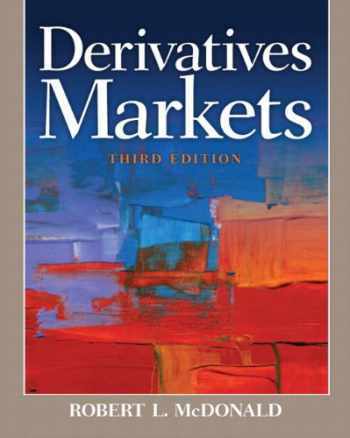 Since then Derivatives Markets (3rd Edition) (Pearson Series in Finance) textbook received total rating of 4 stars and was available to sell back to BooksRun online for the top buyback price of $73.50 or rent at the marketplace. To be financially literate in today’s market, one must have a solid understanding of derivatives concepts and instruments and the uses of those instruments in corporations. The Third Edition has an accessible mathematical presentation, and more importantly, helps readers gain intuition by linking theories and concepts together with an engaging narrative that emphasizes the core economic principles underlying the pricing and uses of derivatives.